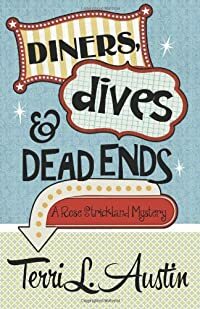 Diners, Dives & Dead Ends by Terri L. Austin, a Mysterious Review. Review: Rose Strickland's close friend hands her his backpack, asks her to keep it safe, then promptly disappears, causing her to worry about his safety … especially after she's accosted herself by men looking for him in Diners, Dives & Dead Ends, the first mystery in this series by Terri L. Austin. Rose has known Axton Graystone forever, from first grade through high school, and though he's not a model citizen — he's been arrested for possession a couple of times — she knows he would never leave without letting her know where he's going. So she's concerned that he hasn't checked in with her, his co-workers, his roommate, or his family. The police won't do anything for 48 hours, but Rose knows she can't wait that long. A black SUV has been tailing her, and two men have broken into her apartment to have a "friendly" chat with her. Axton is definitely in trouble, and her only clue is his backpack. With a title like Diners, Dives & Dead Ends, one might expect a light, possibly culinary-related, cozy-style mystery. That isn't the case here, and while one should never judge a book by its title — or cover — there is a real disconnect between what is suggested (by both) and what is delivered. To its credit, the plot does move along quickly, but is thinly developed. There is, to be sure, an interesting cast of characters, but they, too seem shallow and not fully realized. And it's never promising when the lead character doesn't act smart; in probably the best example of such — it happens early enough in the book not be a spoiler for saying so here — Rose passes along her only connection to Axton — his backpack — to people she barely knows. Often bleak, and lacking a lighter touch that would be more appropriate to its premise, this is not an altogether promising start to this series. Acknowledgment: Henery Press provided an ARC of Diners, Dives & Dead Ends for this review.